Documentation being updating, stay tuned. 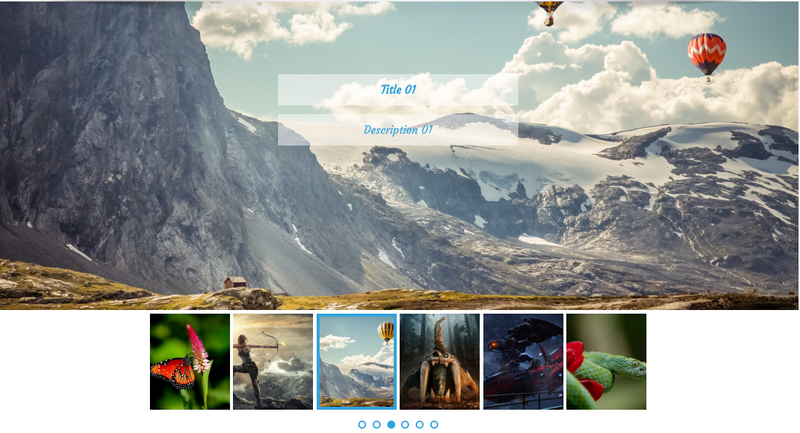 Ultimate Responsive Image Slider Pro a fully responsive image slider plugin for WordPress blog and comes with 5 different slider layout. 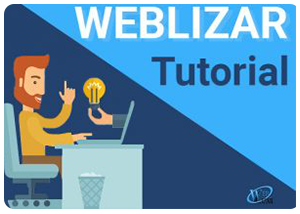 After that click on Upload Plugin button, provide the path of plugin zip package and click on Install Plugin button to start plugin installation. After successful plugin installation click on Activate Plugin link to activate plugin on site. Finally, we have installed & activated plugin on site. 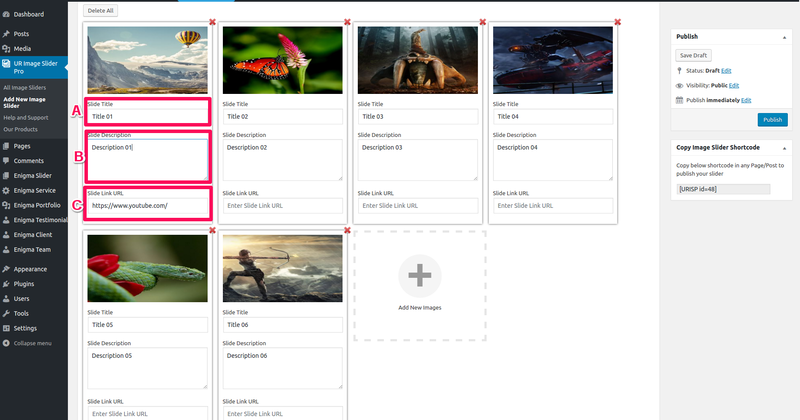 Now, you can access plugin dashboard in admin dashboard area using UR Image Slider menu page. Firstly, check HERE how slider layout 1 design looks like. Also check Layout 1 screenshot below. Step 2) Now two major thing we need to do create as below screenshot. A) Add New Images – Using this button you can upload the images for slider. This is a multiple image uploader to add unlimited images into slider. 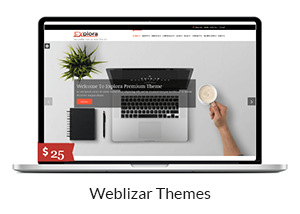 B) Slider Layout (Layout 1) – Select layout 1 for creating slider layout 1 design. 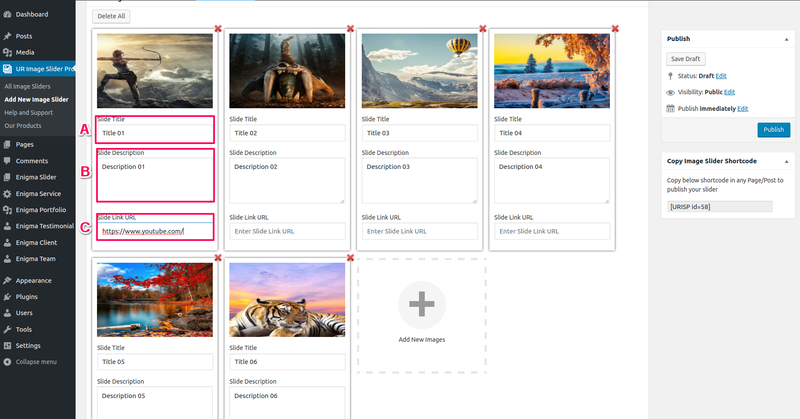 Step 3) We have added 6 image slides using Add New Images button. Now we can set three things for each slide as screenshot below. A) Slide Title – You can set a slide title here. B) Slide Description – You can set a slide description here. C) Read More Link – If you want to set an internal / external link then you can provide the link URL here. All three settings are optional, if you don’t want to show then please leave it blank. Step 4) In this step we can apply various slider settings like text color, alignment, navigation & bullets options and some common settings. We are explaining each settings with it’s screenshot. A) Slider Text Alignment – You can choose 9 different alignment settings for text (Title + Description). Step 5) Publish the Layout 1 Slider into any Page/Post. There are 2 ways to plugin slider in any page or post. 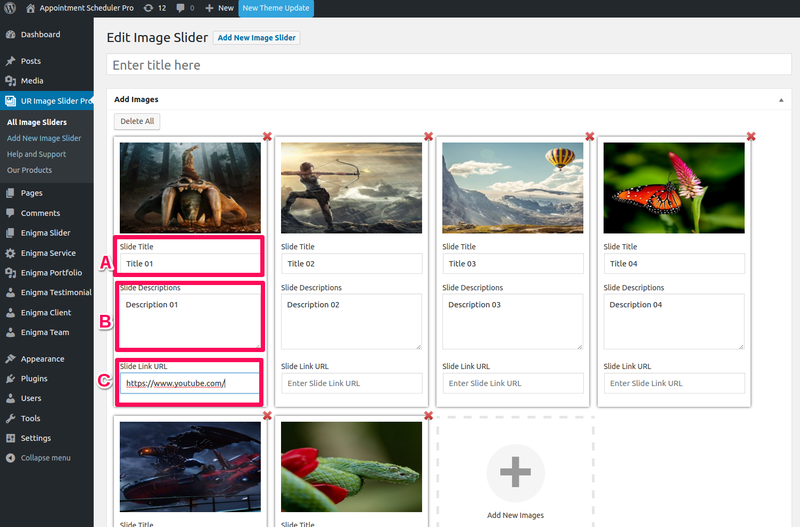 A) First publish the slider post and copy the slider shortcode during Add New Image Slider. Do same as screenshot. 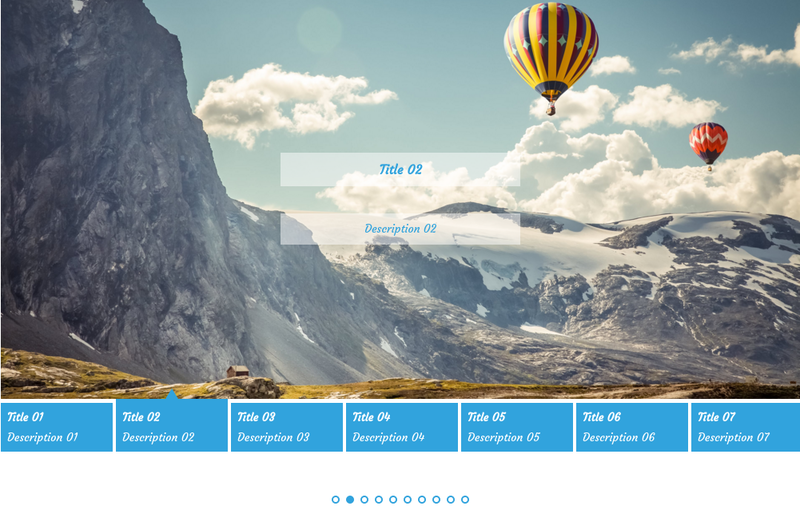 We are creating a New Page for publishing slider. 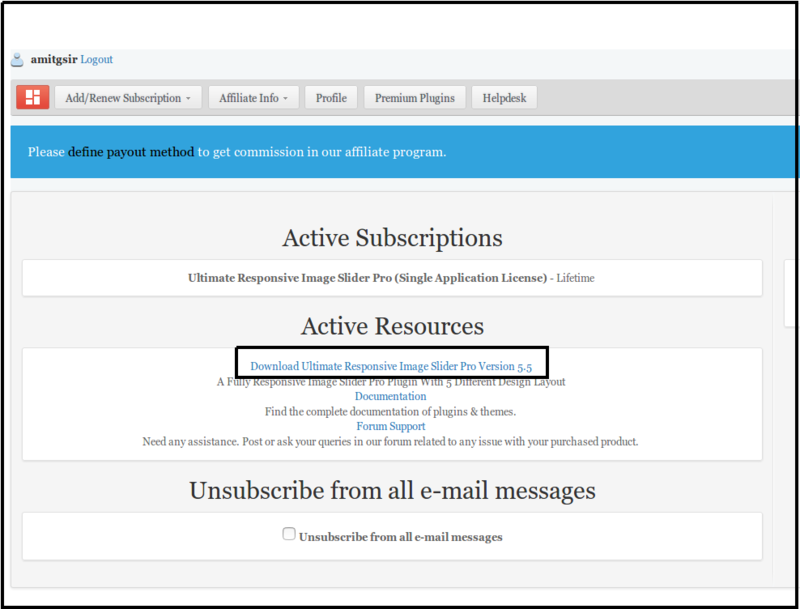 Give title to the new page and paste the shortcode like [URISP id=193] into content editor. 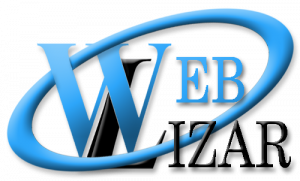 Then select a Full Width Page Template and Publish the page. 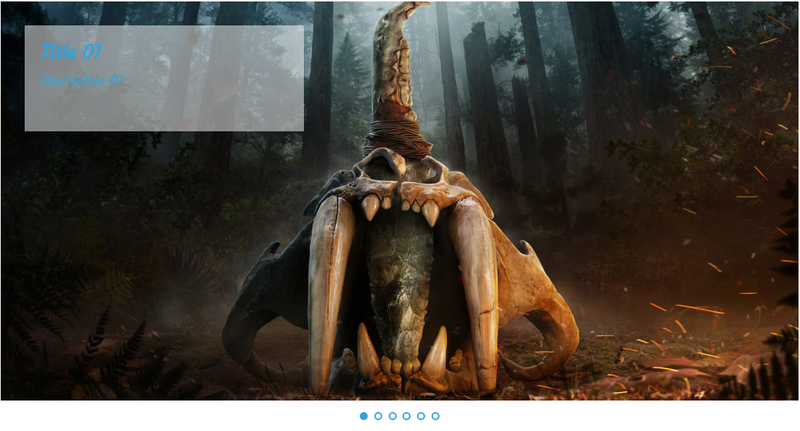 Finally our Layout 1 Style slider has been published. You can now view page to have look of slider. Do same as below screenshot. Firstly, check HERE how slider layout 2 design looks like. Also check Layout 2 screenshot below. B) Slider Layout (Layout 2) – Select layout 2 for creating slider layout 2 design. Step 5) After configuring layout 2 settings, Publish the slider and then copy the slider shortcode. And Create a new Page/Post, paste the slider shortcode into content editor and publish the Page/Post. Firstly, check HERE how slider layout 3 design looks like. Also check Layout 3 screenshot below. B) Slider Layout (Layout 3) – Select layout 3 for creating slider layout 3 design. Step 4) All the settings in layout 3 are do same function as layout 1. Step 5) After configuring layout 3 settings, Publish the slider and then copy the slider shortcode. And Create a new Page/Post, paste the slider shortcode into content editor and publish the Page/Post. Firstly, check HERE how slider layout 4 design looks like. Also check Layout 4 screenshot below. B) Slider Layout (Layout 4) – Select layout 4 for creating slider layout 4 design. Step 4) Layout 4 has some additional settings. And All other settings in layout 4 are do same function as int other layout. Step 5) After configuring layout 4 settings, Publish the slider and then copy the slider shortcode. And Create a new Page/Post, paste the slider shortcode into content editor and publish the Page/Post. Firstly, check HERE how slider layout 5 design looks like. Also check Layout 5 screenshot below. B) Slider Layout (Layout 5) – Select layout 5 for creating slider layout 5 design. Step 4) Layout 5 has some additional settings. And All other settings in layout 5 are do same function as int other layout. Step 5) After configuring layout 5 settings, Publish the slider and then copy the slider shortcode. And Create a new Page/Post, paste the slider shortcode into content editor and publish the Page/Post.